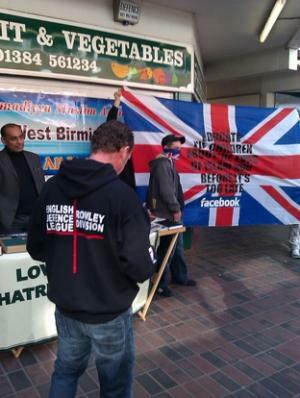 A MUSLIM book stall in Cradley Heath market was stormed by over 25 thugs from the English Defence League this weekend. The shocking attack occurred in front of shoppers, many of which were women and children, at the market at 2.30pm on Saturday. The local Ahmadiyya Muslim book stall and Qur’an exhibition was attacked and volunteers were manhandled and abused by members of the Far Right organisation. Shocked Ahmadiyya outreach worker Toby Ephram described the scene in the market. “We have the book stall to raise awareness of our work in Britain and in the local community we are proud to be British Muslims and this incident saddened us. Last week the News reported the Muslim group was setting up the stall and exhibition in a bid to ‘increase understanding and improve community cohesion’. Halesowen and Rowley Regis MP James Morris condemned the incident and branded it an ignorant and mindless attack. He said: “The people storming the stall may claim that they are defending their English identity, but tolerance for other people’s views and beliefs has long been a key part of what it means to be English. On Boxing Day 2009 Cradley Heath Mosque and Islamic Centre in Plant Street was burnt to the ground by arsonists. Copyright 2001-2011 All rights reserved.